It really is a Happy Monday because I’m on vacation for 3 weeks! Its been years since I’ve had such a long break and I’m planning to really let go and relax. In fact, I might need a vacation from too much relaxation. Anyway thats the plan. And in my case, I feel the saying “the best made plans go awry” was coined with me in mind :). So I flew to India Friday night and I usually have an eventful interesting journey whether it is a weather related delay, extreme turbulence or the airline runs out of food atleast the decent kind, right when they get to my row. So it was quite disconcerting to me that come Friday morning, everything was going smoothly at work and I only had to get to Newark airport late that night. Then around 4pm, I got a call and a cute British accent informed me that my flight was cancelled and did I know about it. I did not. But the airline (British airways) put me on an earlier flight from JFK which was pretty great of them but it also meant that I had to leave right away to the airport as JFK was a good hour and a half from my house. So I thought there’s my hiccup. The cab ride was long and painful and it seemed all of New York had decided to get on the road. My cabbie refused to open the trunk since he wanted a big tip. I was annoyed coz I am a good tipper, dangerously so that my friends often hold an intervention when I speak for those underdogs waiting tables and driving through traffic. But not opening the car and trunk doors freaked me a bit and I was in a hurry so I gave him a couple more dollars and before I knew it he had thrown my bags on to the curb and sped off. In true Mr.Bean like fashion (read clumsy) I grabbed my 3 bags and monster handbag back and forth to the airport entrance to get a cart. The guard or security standing near the carts glared at me coz I was going back and forth leaving one or the other bag unattended for three quarters of a second. Of course it did not occur to him to lend me a hand. 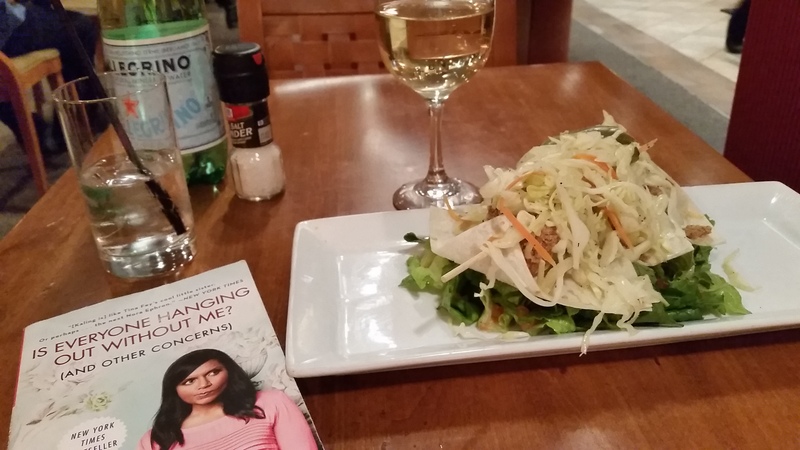 I settled down to this nice airport dinner of fish tacos(its in there some where among the salad), a glass of wine and Mindy Kaling and relaxed while waiting for my flight. The rest of my journey was quite pleasant. I busied myself the first few hours hoping to find some interesting co-passengers to observe. There was one guy a row ahead of me who said yes to everything the stewardess asked him. He wanted an immigration form even though she kindly told him that he was going to be a transit passenger. There was another guy who within five minutes of settling down and fastening his seat belt pressed the assistance button and in full on panic mode demanded his video screen be fixed as the images were shaky. The stewardess politely informed him that once we were airborne she would see if it was still an issue or try to move him to another seat. Aside from this there was very little activity on the flight. The pilot had a very kindly Hugh Grant voice and gave regular flight updates. I passed in and out of consciousness sleep during the entire flight and finally awoke when I landed in Chennai. I was excited to see my family and now I start my vacation! « Photo A Day- M for…..